My carpet doesn’t have a filter, does it? Well not really, but it does function like a filter. For reasons I’ll explain later, this filtering is very beneficial. Have you ever really thought about what is really being collected, tracked through and spilled into your carpets? The most common household pollutants are; dirt, dust, pollens, stearic acid, pet dander, asphalt, sand, smoke residues, hydrocarbons, mites, tar, bacteria, foods, drinks, fungus, and some times viruses. Quite a few eh! The hydrocarbons come from outdoor pollution and your appliances; stearic acids come from cooking food. How many of these common everyday pollutants would you say are not in your carpets and upholstery this very minute? Not a pleasant thought is it? You might say… not my carpets they are clean. Perhaps, but carpets are designed to hide soil from your eyes. Keeping it trapped below the surface where it does the most harm. Not convinced? Do a little test. Place a new bag inside your vacuum; thoroughly vacuum all your carpets. When done remove the bag and cut it open and take a look at what really inside your visually clean carpets. Now considering that all of this disgusting stuff is in your carpet, and more is likely to be brought in everyday, eventually the carpet will become full. As you walk across your carpets you re-distribute the dust and pollutants back into the air you and your family breathe. As a result of being full, your carpets will also begin to appear visually dirty. This visual soil may take upwards of 1-2 years before it finally shows itself. By then it has done a lot of damage to your carpet, and has contributed to greatly having poor Indoor Air Quality (IAQ). Well for starters you really should clean your carpets and flooring more often.Shaw Industries the worlds largest carpet manufacturer, recommends, that you have your carpets professionally cleaned every 6 to12 months, just to maintain the warranty. Comprehensive scientific studies have proven that by simply cleaning your carpets you will drastically improve the indoor air quality of your home, making it a healthier place for you and your family. Consider this… most of us wear our clothes once and then place in the laundry for washing, yet our carpets and upholstery go unwashed for as much as 1-3 years or more. Can you imagine wearing the same pair of socks for a week, let alone 1-3 years? Your carpets are subjected to far more pollutants on a daily basis than a pair of socks, yet most of us do not clean our carpet regularly. View your carpets for what they are, a soft, warm, and comfortable pollution filter, that requires maintenance and cleaning. Ideally in addition to frequent vacuuming and spot cleaning, your carpets should be professionally cleaned at least every 12 months. As mentioned at the beginning, the benefit of having a carpet filter in your home will result in less airborne dust and pollutants in your home. A simple comparison: Two identical homes, with the same number of family members and traffic patterns. One has carpet throughout and the other tile and wood floors only. With or without the AC or furnace running, which house would you say has a better indoor air quality? If you said the house with the tiled floors you are incorrect. Why? Without the benefit of a carpet to trap the indoor dust and pollutants, they would re-circulate constantly throughout the house. More so if the AC or heater was operating. All of these circulating pollutants contaminate the breathing air mass. The tiled house still needs to be swept, vacuumed, dust and mopped almost daily, and still needs a professional tile and grout cleaning every 12-24 months to keep up with the pollutants and dust circulating through the house. Studies have revealed that most homes indoor air is more polluted than the outside air. Is yours? Keep up on the dry particulate soil, especially in here in Southern Nevada, by investing in an efficient vacuum cleaner. Make sure it comes with a HEPA filter to capture the very small particles that normally go right through most vacuums and right back into the room. By frequent and thoroughly vacuuming your carpets you can remove as much as 70% of the dust and pollutants that exist in your carpets. The remaining 30% is usually trapped within the carpet fibers, or has bonded to the sticky, wet soils. Thus the need for professional carpet cleaning. The key to carpet longevity is through maintenance. Water damage actually happens when the leak continues for an extended amount of time. So it is very important that you act as quickly as possible to fix the problem and limit the amount of Water damage to your property, when you discover flooding in your home. Water damage restoration is a serious undertaking and not to be taken lightly. Documentation of damage is only done by identifying the source of the water damage and accurate estimates are needed for a proper water damage clean up. If it is taken lightly and not done properly by appropriate skilled and experienced team of water damage professionals then you could at the least fail to fix the problem and that will cause greater damage to the affected property and suffer greater losses. You definitely need to hire the services of some appropriate emergency water damage restoration professionals, if you want to minimize the amount of damage done to your home. The type of water damage cleanup services required from experts of a water damage restoration company, wholly depends on the type of water involved in water damage such as damage originated from grey water which is a type of water damage which contains various harmful bacteria and large amount of chemicals as containment that may even cause sickness to affected humans. The last type of water which is involved in water damage is the black water that contains harmful bacteria like E coli and other unsanitary agents like fungi. This type of harmful water damage originally caused by black water is specifically associated with unwanted sewage water contaminated with dirt and harmful components coming into the house will surely result in sickness. Exterior Check: The exterior of houses or buildings can be a common entry way for water. Water finds its way into the house if there are cracks exposed on your exterior walls or roof. You first need to ensure that all the cracks are completely fixed and covered. Floor Check: As we know that it is generally not possible to see underneath the flooring in your home but it is definitely possible for you to see what is happening with them and around them. You need to make sure that all exposure in your flooring is non-existent. This could definitely be a saving observation on user’s part. Pipeline Check: The pipe leaks and bursts are among the most responsible factors for creating water damage in the residence or building. If you notice any moisture forming in your walls or ceiling, then it may be the perfect time to invite a water damage professional in order to inspect the area on your behalf. There are very less chances that you will have to invite back a similar professional to complete what is likely to be a costly water damage restoration only by taking preventive measures now. Las Vegas’ water damage experts Carbonated Solutions of Las Vegas is available 24 hours a day seven days a week and we are just a phone call away. For water damage emergencies call 702-423-6092. The first step in proper stone care and maintenance is to understand your natural stone’s geological classification and composition. this information will help you to identify what cleaning products to use and how best to care for your natural stone. Dust Mopping: Dust mop interior floors frequently using a clean non-treated dry dust mop. Sand, dirt and grit are abrasive and can damage natural stone in Las Vegas. Mats/rugs: Mats or area rugs inside and outside an entrance will help to minimize the sand, dirt and grit that may scratch the stone floor. Be sure that the underside of the mat or rug is a slip resistant surface, while also allowing the natural stone to breathe. Vacuum cleaners: If used, be sure the metal or plastic attachments or the wheels are not worn as they can scratch the surface of most natural stones. Spills: Blot the spill with a micro fiber towel immediately. Don’t wipe the area, it will spread the spill. Flush the area with water and a neutral PH stone cleaner and rinse several times. Dry the area thoroughly with another dry micro fiber towel. Repeat as necessary. Clean natural stone surfaces with a neutral cleaner or stone soap. Similar to any item cleaned in your home, an excessive concentration of cleaner or soap may leave a film and cause streaks. Follow manufacturer’s cleaning recommendations. Use a micro fiber dust mop on floors and a soft cloth for other surfaces for best results. In the bath or other wet areas, soap scum can be minimized by using a squeegee after each use. To remove soap scum, use a non-acidic soap scum remover. In outdoor pool, patio or hot tub areas, flush with clear water and use natural stone sanitizing solution to remove algae or moss. Many suppliers offer products used for natural stone cleaning. Scouring powders or creams often contain abrasives that may scratch certain natural stones. Many commercially available rust removers (laundry rust stain removers, toilet bowl cleaners) contain trace levels of hydrofluoric acid (HF). This acid attacks silicates in addition to other minerals. All natural stones, including marble, travertine, limestone, granite and quartzite, will be attacked if exposed to HF. Sealing is a common step taken on some stones as an extra precaution against staining. In fact, the sealing products used in the stone industry are ‘impregnators” which do not actually seal the stone, but more correctly act as a repellent rather than a sealer. Sealing does not make the stone stain proof, rather it makes the stone more stain resistant. When consulting with your Las Vegas natural stone cleaner, you may find that many stones do not require sealing. However, applying an impregnating sealer is a common practice. If a natural stone sealer is applied in a food preparation area, be sure that it is non-toxic and safe for use. Consult with your supplier or your natural stone sealing company specific to the type of stone sealer and frequency of use recommended. Surface stains can often be removed by cleaning with an appropriate cleaning product. Oil-based (grease, plumbers’ putty, tar, cooking oil, milk, cosmetics) An oil-based stain will darken the stone and normally must be chemically dissolved so the source of the stain can be flushed or rinsed away. Clean gently with a soft, liquid cleanser with one of the following: household detergent, mineral spirits, or acetone. Organic (coffee, tea, wine, fruit, tobacco, paper, food, urine, leaves, bark, bird droppings) May cause a pinkish-brown stain and may disappear after the source of the stain has been removed. Outdoors, with the sources removed, sun and rain action will generally bleach out the stains. Indoors, clean with 12% hydrogen peroxide (hair bleaching strength) and a few drops of ammonia. Metal (iron, rust, copper, bronze) Iron or rust stains are orange to brown in color and follow the shape of the staining object such as nails, bolts, screws, cans, flower pots, metal furniture. Copper and bronze stains appear as green or muddy-brown and result from the action of moisture on nearby or embedded bronze, copper or brass items. Metal stains must be removed with a poultice. Deep-seated, rusty stains are extremely difficult to remove and the stone may be permanently stained. Biological (algae, mildew, lichens, moss, fungi) Clean with diluted cleaning solution. Use a 1/2 cup of any of the following: ammonia, bleach, or hydrogen peroxide and a gallon of water. Reminder: do not mix bleach and ammonia. Ink (magic marker, pen, ink) On light colored stones, clean with bleach or hydrogen peroxide. On dark colored stones, clean with lacquer thinner or acetone. Paint Small amounts can be removed with lacquer thinner or scraped off carefully with a razor blade. Heavy paint coverage should be removed only with a commercial “heavy liquid” paint stripper available from hardware stores and paint centers. These strippers normally contain caustic soda or lye. Do not use acids or flame tools to strip paint from stone. Paint strippers can etch the surface of the stone; re-polishing may be necessary. Follow the manufacturer’s directions for use of these products, and flush the area thoroughly with clean water. Protect yourself with rubber gloves and eye protection, and work in a well-ventilated area. Use only wood or plastic scrapers for removing the sludge and curdled paint. Normally, latex and acrylic paints will not cause staining. Oil-based paints, linseed oil, putty, caulks and sealants may cause oily stains. Refer to the section on oil-based stains. Water Spots and Rings (surface accumulation of hard water) Buff with dry steel wool. Fire and Smoke Damage Older stones and smoke or fire stained fireplaces may require a thorough cleaning. When the smoke is removed, there may also be some etching (due to carbonic & other acids in smoke). Commercially available “smoke removers” may save time and effort. Etch Marks (caused by acids left on the surface of the stone) Some materials will etch the finish but not leave a stain. Others will both etch and stain. Contact your Las Vegas natural stone cleaning company and professional stone restorer for refinishing or re-polishing acid etched areas. Efflorescence (a white powder that may appear on the surface of the stone) It is caused by the deposition of mineral salts carried by water from below the surface of the stone. When the water evaporates, it leaves the powdery substance. If the installation is new, dust mop or vacuum the powder. You may have to do this several times as the stone dries out. Do not use water to remove the powder; it will only temporarily disappear. If the problem persists, contact your installer to help identify and remove the cause of the moisture. Scratches and Nicks Slight surface scratches may be buffed with dry 0000 steel wool. Deeper scratches and nicks in the surface of the stone should be repaired and re-polished by a professional. Using a Poultice for more information, or call a natural stone cleaning professional company (recommended). Natural Stone Easy to Clean and Maintain! Call Carbonated Solutions your local professional. Las Vegas’ marble, travertine, limestone, granite, flagstone, and other natural stone cleaning specialist for problems that appear too difficult to handle. That dirty grout in between your tile floors can be a real eye sore. Years worth of packed in dirt, grease and food stains in your kitchen counters and floors, coffee stained grout lines in your dining room and family room floors, soil build up in your entry tile and let’s not forget the dreaded mildew stains in your shower walls. And worse of all, cleaning the stained grout can be impossible when utilizing traditional tile cleaning methods. Our powerful truck mounted tile and grout cleaning system will surgically remove years worth of built up dirt, grime and germs returning your tile and grout surfaces to a like-new condition, without the need to regrout, saving you valuable time and money. After cleaning your tile and grout, if requested, we will seal out any future stains with our clear grout sealaer or our epoxy grout color sealer process. This will help maintain the natural beauty of your tile and grout for years to come. So it has come time to schedule carpet cleaning for your Las Vegas or Henderson Nevada home or business, and you are not sure who to call. 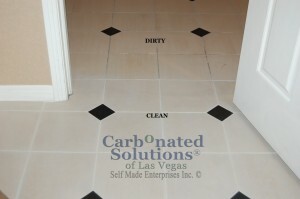 Let Carbonated Solutions of Las Vegas carpet cleaners give you a few tips that will save you a headache, and help you make up your mind. It’s important to clean your carpets – they look better and last longer. Everyone wants to save money, but if you hire someone to do the job, make sure you go with a reputable company that knows what it’s doing and will guarantee its work.”When you see those commercials or you have those flyers for what seems like a too good to be true offer to get your carpets cleaned, it’s probably too good to be true,” says Cheryl Reed with Angie’s List. First of all never fall prey to the old trick ” bait and switch”. This is where a carpet cleaning company offers a super low price, like $49 or $59 for your whole house carpet to be cleaned. If a carpet cleaning company is offering you a price that is too good to be true, it usually is too good to be true. The low price gets the high pressure salesman in the door, be careful because the consumer is often outmatched and taken advantage of. These are not professional and not honest business people. Make sure you do a google search, check the Southern Nevada Better Business Bureau, and read some reviews of the local carpet cleaning companies around you. More times than not, if a company does not have tons of negative reviews, and you can easily find them online they will be a legitimate carpet cleaning company. Now for the cost… make sure when you call to schedule your carpet cleaning you get an estimate over the phone. Make sure to let them know the condition of your carpet. If you have any heavily soiled areas, stains, pet stains, or pet odors. If so ask for a price to remove these from your carpeting. Carpet cleaning companies will always have ad-ons than you can purchase, this is very normal and expected… but if they do not come close to the price they quoted you then call them on it immediately! The industry average for Las Vegas is around $30 per room for basic cleaning. If you are in the Las Vegas, Henderson, or North Las Vegas, Nevada area, call Carbonated Solutions of Las Vegas carpet cleaners. We have hundreds of great carpet cleaning reviews and have been an A rated carpet cleaning company on Angie’s List for over 5 years. Carbonated Solutions is a franchise that is properly licensed and insured, and never employs sub-contractor carpet cleaners.